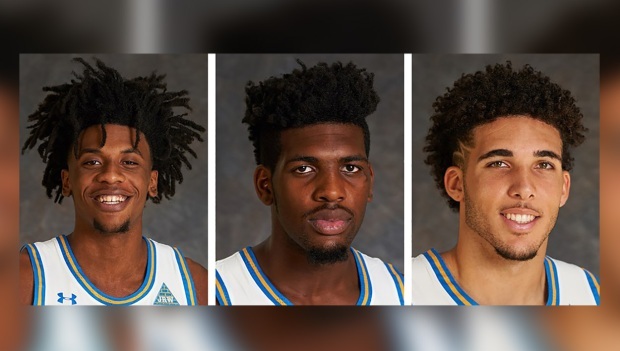 Three UCLA basketball players detained in China on suspicion of shoplifting returned home to the United States Tuesday. Pac-12 Commissioner Larry Scott said early Tuesday that the Bruins players, detained Nov. 7, were on a plane bound for Los Angeles, adding that the "matter has been resolved to the satisfaction of the Chinese authorities." They arrived at Los Angeles International Airport around 5 p.m. Tuesday. "We are all very pleased that these young men have been allowed to return home," said Scott. The team scheduled a news conference for Wednesday with the players -- Cody Riley, Jalen Hill and LiAngelo Ball -- the brother of Los Angeles Lakers rookie Lonzo Ball. Head coach Steve Alford and athletic director Dan Guerrero also are expected to speak at the 11 a.m. PT news conference. 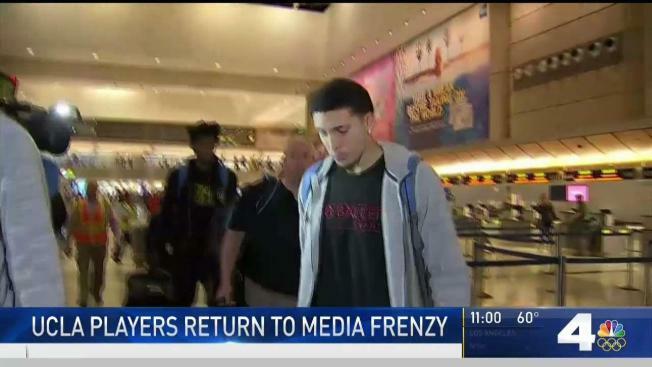 The Wall Street Journal reported earlier Tuesday that the players had been seen boarding a plane bound for LAX. The report came after President Donald Trump said he had a long conversation on the matter with Chinese counterpart Xi Jinping. Trump said he was hopeful the athletes would return home soon. "We are grateful for the role that our Chinese hosts played, and for the courtesy and professionalism of the local authorities," Scott said in his statement. "We also want to acknowledge UCLA's significant efforts on behalf of their student-athletes. Finally, we want to thank the President, the White House and the U.S. State Department for their efforts towards resolution." Trump spoke to reporters in the Philippines as he prepared to return to Washington after a nearly two-week visit to Asia that included an earlier stop in Beijing. "He's been terrific," Trump said, in an apparent reference to Xi. Asked about the case Tuesday, China's foreign ministry said it had no additional comment. On Monday, ministry spokesman Geng Shuang said that three American men were being investigated in the eastern city of Hangzhou for alleged theft and that China and the U.S. were in contact over the matter. "China will handle this case in accordance with law and protect the lawful rights and interests of the people involved," Geng said. Three freshman UCLA Basketball players are on their way home from China after being detained on suspicion of shoplifting in Shanghai. Chinese authorities detained the UCLA freshmen for questioning about allegations of shoplifting before a recent game against Georgia Tech in Shanghai. The UCLA team returned to the U.S. without them on Saturday. The three players were not allowed to participate in the Bruins' Saturday game in Hangzhou, China, which UCLA won 63-60. UCLA is scheduled to host Central Arkansas Wednesday at Pauley Pavilion. It was not immediately clear whether Ball, Hill and Riley will be allowed to play. The school's chancellor released a statement late Tuesday morning. "I would like to express my gratitude to all who helped us get to this point," said Chancellor Gene Block. "I also want to acknowledge everyone who wrote or called to express their thoughts and concerns. We have heard and appreciate everyone’s views. I want to be clear that we take seriously any violations of the law. We remain one of the world's top academic institutions in large part because of our values and standards, which we work hard to infuse throughout our campus community. "When members of the UCLA family fail to uphold these values, we review these incidents with fair and thorough processes. In this particular case, both Athletics and the Office of Student Conduct will review this incident and guide any action with respect to the involved students. Such proceedings are confidential, which limits the specific information that can be shared." The State Department said it's aware three U.S. citizens were allowed to leave China, but referred questions to the Pac-12 Conference. Citing a source with firsthand knowledge of the investigation, ESPN last week reported the players could be in Hangzhou for "a week or two" while the situation is resolved. The source told ESPN there is surveillance footage of the players shoplifting from three stores inside a high-end retail center.